STEP 1: The eligible entity shall apply for Issuance of REC on the Web Based Application and shall also submit the same information in physical form with the Central Agency. The application for issuance of certificate shall include (i) Energy Injection* Report duly certified by the concerned State Load Despatch Centre (ii) Registration Certificate and shall be made in the specified format (FORMAT- 3.1: "Application for Issuance of Renewable Energy Certificates to the Eligible Entities"). The application shall be accompanied by applicable fee & charges. An application for issuance of Renewable Energy Certificate shall be made by the Eligible Entity to the Central Agency. The eligible entity shall apply for Issuance of REC on the Web Based Application and shall also submit the same information in physical form with the Central Agency. 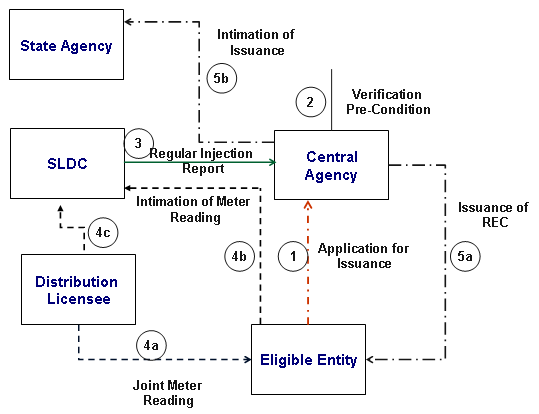 The application for issuance of certificate shall include (i) Energy Injection* Report duly certified by the concerned State Load Despatch Centre (ii) Registration Certificate and shall be made in the specified format (FORMAT- 3.1: "Application for Issuance of Renewable Energy Certificates to the Eligible Entities"). The application shall be accompanied by applicable fee & charges towards issuance of certificates as determined by CERC from time to time. While making application for issuance of RECs, the Applicant (Eligible Entity) shall quote the unique Registration Number assigned to it by Central Agency at the time of registration. Note :- Injection shall include self consumption of the Captive Power Plant if it is separately metered and measurable. STEP 2: The Central Agency shall assign an acknowledgement number to the Eligible Entity for its registered application request for issuance of Renewable Energy Certificates, referring to Unique Number assigned to the concerned Eligible Entity at the time of registration, for any future correspondence. The application is made in the format specified by the Central Agency from time to time. The status of Accreditation of the Eligible Entity with the Central Agency has not expired. The status of Registration of the Eligible Entity with the Central Agency has not expired. The duly ceritfied Energy Injection report by the concerned State Load Despatch Centre is attached for the same period for which application is made towards issuance of Renewable Energy Certificate by the Eligible Entity. The application is accompanied with fees & charges. STEP 4: After conducting the preliminary scrutiny, the Central Agency shall intimate in writing to the Applicant for submission of any further information or seek clarification, if necessary, to further consider the application for issuance of Renewable Energy Certificates or reject application. The reasons for rejecting the application for issuance of Renewable Energy Certificates shall be recorded and intimated to Applicant in writing within 2 working days from date of receipt of the completed application by Central Agency. Verification of the time period for which the Central Agency may have already issued Renewable Energy Certificates to the concerned Eligible Entity. Verification of Renewable Energy Certificates claimed by the Eligible Entity from the duly certified Energy Injection Reports by the concerned State Load Despatch Centre in respect of concerned Eligible Entity. Details of fee & charges made for issuance of certificates. Confirmation of Compliance Auditor report, if any. STEP 6: The Central Agency shall only issue Renewable Energy Certificates to the Eligible Entity after confirming, the claims made by the Eligible Entity, with the Energy Injection Report submitted by the SLDC. In case of any discrepancy, in the Energy Injection Report enclosed by the Eligible Entity along with Application and regular Energy Injection Report received by Central Agency from concerned State Load Despatch Centre, the information contained in regular Energy Injection Report furnished by concerned State Load Despatch Centre shall be considered as final and binding for the purpose of issuance of Renewable Energy Certificates. However, in case energy units reported under Energy Injection Report by concerned State Load Despatch Centre exceed that claimed by Eligible Entity for same period then, Central Agency shall seek necessary clarification from concerned State Load Despatch Centre before issuance of the Renewable Energy Certificates. The denomination of each REC issued would be as per the CERC REC Regulations and 1 REC would be taken as equivalent to 1 MWh of energy injected into the grid. It is clarified that any fractional component of energy as per the Energy Injection Report can be accumulated and would be considered for issuance of RECs as per the CERC REC Regulations. STEP 7:The Central Agency shall issue the Renewable Energy Certificates to the Eligible Entity within fifteen (15) days from the date of receipt of application form along with complete information necessary for processing of application for issuance of RECs. STEP 8: In case the Eligible Entity is not fulfilling any of the conditions mentioned under Step-5 and fails to provide necessary information/clarification in the matter within stipulated timeframe, the Central Agency may reject the application and shall intimate to the Eligible Entity, in writing, the reasons for rejecting the application for issuance of RE certificates. STEP 9: Upon issuance of RE Certificates to Eligible Entity, the Central Agency shall also intimate about such issuance to the concerned State Agency.